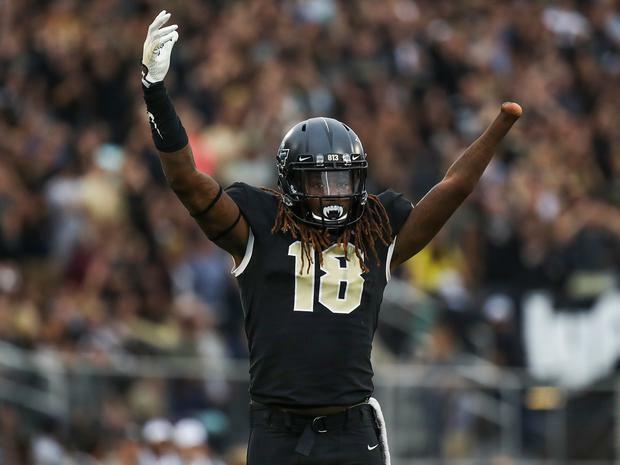 NFL prospects are accustomed to seeing every aspect of their lives scrutinised but having had his left hand amputated as a child, Shaquem Griffin has experienced more scepticism than most. Next week's draft is the culmination of a lengthy process where the 32 teams pore over each player's technical, mental and physical attributes to determine if they are a suitable fit. Griffin, a linebacker from the University of Central Florida, is unlike any of his peers. In fact, he is unlike any NFL player ever. Griffin was born with a condition that prevented the fingers on his left hand from fully developing. At the age of four, the pain was so severe his mother found him in the kitchen with a knife attempting to cut his fingers off. The following day he was taken to the hospital and would have surgery to remove his left hand. Of all the paths Griffin could have then followed, he pursued the one he was urged to avoid. "A lot of people told me that football was a two-handed game, not one," Griffin said. "I knew then that I had to work harder and fight through adversity and prove everybody wrong, and I knew that was going to be at every level of my life. "There are still going to be people doubting me about having one hand and being able to play football. I have no problem with proving people wrong." Griffin was a talented athlete - at March's NFL Combine he ran the quickest 40-yard dash for a linebacker since 2003 - but his first love was football and he would even sleep in his kit. His father, Terry, built contraptions so his son could lift weights and train with his twin brother Shaquill, who is already in the NFL with the Seattle Seahawks. And Shaquem Griffin was determined not to be held back by his birth defect, even convincing his dad to let him play at running back where keeping hold of the ball is paramount. "My dad said, 'You can't play running back because if I can take the ball from you, that means everybody else can'," Griffin explained. "I was like, 'You're not going to take the ball from me'. In the backyard my dad tried to grab at it and he was swinging me all over the place but I never let go of the ball - that's when he allowed me to play running back. "One season I scored 15 touchdowns and I never fumbled once because I knew if I fumbled my dad was going to tell me I couldn't play running back no more!" Griffin hopes to make it on defence in the professional ranks and he was productive at UCF, winning their conference's defensive player of the year award in 2016 and then starring for an unbeaten team last season. But it was at the NFL Combine where he gained global interest and enhanced his draft prospects, with Griffin now likely to hear his name called in the middle rounds. As well as his blistering 40-yard dash time the 22-year-old also bench-pressed 225 pounds 20 times, three more than his twin managed, having attached a prosthetic hand onto the bar. NFL defensive stars JJ Watt and Von Miller were among those to react in awe on social media but others were impacted too. Griffin met with children who have prosthetic arms at UCF's pro day recently and hopes his story has an influence way beyond the gridiron. "Moments like that are the best for me," he said. "Being able to impact kids and be an inspiration to others, that's the biggest reward for me. It goes to show that what I'm doing is working and I'm doing something for a purpose."